We’ve transformed this 1920s Lawrence Sperry Seaplane Factory into a one of a kind facility tailored to the needs of people who love the water. Changing this place from an industrial site of the last century to a waterfront location for this century has given many from Long Island and beyond the chance to get out and enjoy the natural beauty of our Great South Bay. If you’re in the area come over and stop by. We look forward to seeing you here. We are 45min away from Manhattan or (depending on traffic) Come on over, spend a few hours floating in the Great South Bay, and enjoy a wonderful day on the water. 2. Make a Left onto Merrick Road and head East 1 traffic light. 3. Make a right at the light onto South Bayview Avenue. 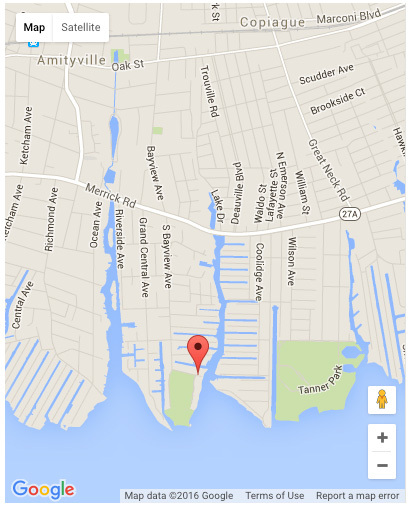 *If lost just call us (631)264-0005 we'll help you get here.